The E Bike Booster is a new tuning tool for Heinzmann DirectPower rear-wheel engines – a kind of motor which is being used in, for example, ELFEI V3 conversion kits for rear-wheel drive systems. Normally, a Heinzmann DirectPower engine supports only up to 25 km/h – but if you use the E Bike Booster, the maximum engine support will reach up to 60 km/h! 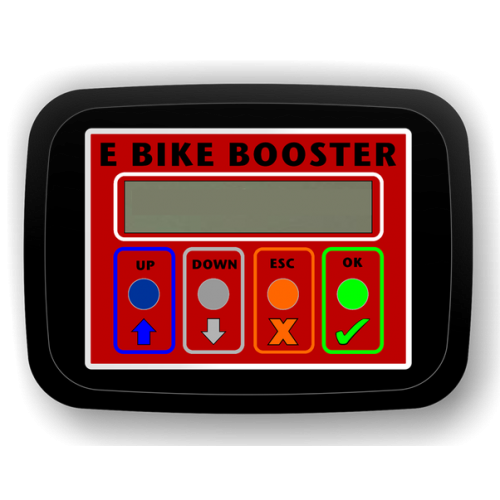 A great advantage of the E Bike Booster is that your electric bike display will still show the current speed and other data correctly. Furthermore, the E Bike Booster enables you to set the starting assistance individually from 1 to 15 km/h (normally, the starting assistance supports only up to 6 km/h). By the way, the E Bike Booster can be installed very easily, the engine does not have to be removed and there are no special technical skills required. Simply connect the Booster to your electric bike and use the control buttons to adjust the settings – that´s all! After this is done, simply remove the Booster again (the device does not remain at your bike). Now your Heinzmann engine is tuned and you can drive up to 60 km/h (about 37 mph) with the motor power still assisting! Off course, you can cancel the tuning whenever you want to – simply connect the E Bike Booster again and restore the bikes original condition. At the moment, there is only the E Bike Booster version for Heinzmann DirectPower engines available – and this version can be used to make ELFEI V3 electric bikes faster, too. - Each E Bike Booster is limited to 1 electric bicycle. - If you connect the E Bike Booster to a certain electric bike, it gets coupled to this bike and it can´t be used at another electric bikes anymore. - You can use the Booster to adjust the settings of the coupled electric bike as often as you want to. - But you have got the option to uncouple the E Bike Booster from your electric bike again. After that, the Booster can be used at another electric bicycle. - The E Bike Booster can only be used to tune exactly 1 electric bike at the same time.